Midnight Muse Media was formed in November, 2011 by Dave DeWhitt and serves as the publishing and promotional outlet for Dave's musical and creative endeavors. The name Midnight Muse is a tribute to the flashes of creative inspiration that keep Dave awake most nights (it sounds better than insomnia). 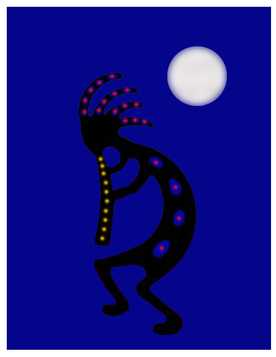 The dancing flute player in the logo is Kokopelli, a native Southwest American fertility deity who shows up in rock paintings and carvings that are thousands of years old. According to legend, Kokopelli travelled from village to village, bringing abundance and joy wherever he visited. His flute playing was said to change winter into spring, and his humped back represented a pack that was filled with seeds for planting, and songs for celebration. When Kokopelli visited, villagers danced and sang all night in celebration, and in the morning when he left, the harvest was bountiful in the fields and all the women in the village were pregnant. Good times! Kokopelli - Watch out, ladies! 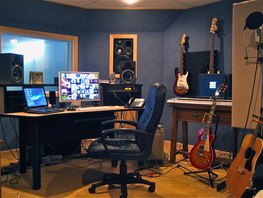 Midnight Muse Studio is Dave's basement recording studio, which consists of a control room and a live tracking room. We use Focusrite pres/IO and Logic on a Mac Pro for recording, and real instruments, mics, and amps for tracking.